Dr. Robert Davey, Scientist and Ewing Halsell Scholar in the Department of Immunology and Virology at Texas Biomedical Research Institute, announced on February 26, 2015, that a small molecule called Tetrandrine, derived from an Asian herb, has shown to be a potent small molecule inhibiting infection of human white blood cells in in vitro experiments and prevented Ebola virus disease in mice. Tetrandine is currently approved for use in humans as a blood pressure medication. In their new work, the scientists found that Ebola virus entry into host cells requires the endosomal calcium channels called “two-pore channels” (TPCs). Disrupting TPC function by gene knockout, small interfering RNAs, or small molecule inhibitors halted virus trafficking and prevented infection. Tetrandrine, the most potent small molecule the scientists tested, inhibited infection of human macrophages, the primary target of Ebola virus in vivo, and also showed therapeutic efficiency in mice. The scientists concluded that TPC proteins play a key role in Ebola virus infection and may be effective targets for anti-viral therapy. The work will be reported on February 27, 2015 in Science in an article entitled “Two-Pore Channels Control Ebola Virus Host Cell Entry and Are Drug Targets for Disease Treatment.” The latest outbreak of Ebola virus disease has caused the death of more than 9,400 people worldwide and created an international crisis that has shown few signs of stopping, continuing to infect thousands in West Africa. Ebola virus causes hemorrhagic fever in humans and currently has no approved therapy or vaccine. Scientists at Texas Biomed have been working in the Institute's Biosafety Level 4 containment laboratory for more than ten years to find a vaccine, therapies, and detection methods for the virus. Dr.
Colorado potato beetles are a dreaded pest of potatoes all over the world. Because they do not have natural enemies in most potato-producing regions, farmers try to control them with pesticides. However, this strategy is often ineffective because the pest has developed resistances against nearly all insecticides. Now, scientists from the Max Planck Institutes of Molecular Plant Physiology in Potsdam-Golm and Chemical Ecology in Jena have shown that potato plants can be protected from herbivory using RNA interference (RNAi). The scientists genetically modified plants to enable their chloroplasts to accumulate double-stranded RNAs (dsRNAs) targeted against essential beetle genes. The results will be published in the February 27, 2015 iissue of Science. The article title is “Full Crop Protection from an Insect Pest by Expression of Long Double-Stranded RNAs in Plastids.” RNA interference (RNAi) is a type of gene regulation that occurs naturally in eukaryotes. In plants, fungi, and insects it also is used for protection against certain viruses. During infection, many viral pathogens transfer their genetic information into the host cells as double-stranded RNA (dsRNA). Replication of viral RNA leads to high amounts of dsRNA which is recognized by the host's RNAi system and chopped up into smaller RNA fragments, called siRNAs (small interfering RNAs). The cell then uses siRNAs to detect and destroy the foreign RNA. But the RNAi mechanism can also be exploited to knock down any desired gene, by tailoring dsRNA to target the gene's messenger RNA (mRNA). When the targeted mRNA is destroyed, synthesis of the encoded protein will be diminished or blocked completely. Targeting an essential gene of a crop pest can turn dsRNA into a precise and potent insecticide. Cancer researchers at Indiana University report that approximately 15 percent of people with pancreatic cancer may benefit from therapy targeting a newly identified gene signature associated with up-regulated angiogenesis. Using data from The Cancer Genome Atlas (TCGA), Murray Korc, M.D., the Myles Brand Professor of Cancer Research at the Indiana University School of Medicine and a researcher at the Indiana University Melvin and Bren Simon Cancer Center, and colleagues found that a sub-group of pancreatic cancer patients who possess a strong angiogenic gene signature could benefit from personalized therapies that cut off the angiogenic pathways that feed the cancer's growth. This particular gene signature is associated with enabling abnormal blood vessels to form in tumors, which feeds the tumor's growth. The finding, published online on February 25, 2015 in Oncotarget, is new because the prevalence of this signature was not previously known. The authors also demonstrated, for the first time, that endothelial cells, the main type of cell found in the inside lining of blood vessels, can produce molecules that directly stimulate the growth of pancreatic cancer cells. "We showed that endothelial cells can stimulate the growth of pancreatic cancer cells and that by silencing or inhibiting certain pathways--JAK1-2 and STAT3--we can alter that effect," Dr. Korc explained. "We demonstrated that it is possible to target these pathways and prolong the survival of genetically modified mice whose pancreatic cancers also have a strong pro-angiogenic gene signature." Thus, for pancreatic patients with a strong pro-angiogenic gene signature, the finding suggests that they may benefit from targeted therapy that is directed against one of these pathways. A research team led by investigators from Mayo Clinic’s campus in Jacksonville, Florida, and the University of Oslo, Norway, has identified a molecule that pushes normal pancreatic cells to transform their shape, laying the groundwork for the development of pancreatic cancer, one of the most difficult tumors to treat. The team’s findings, reported online on February 20, 2015 in Nature Communications, suggest that inhibiting the gene, protein kinase D1 (PKD1), and its protein could halt progression and spread of this form of pancreatic cancer, and possibly even reverse the transformation. “As soon as pancreatic cancer develops, it begins to spread, and PKD1 is key to both processes. Given this finding, we are busy developing a PKD1 inhibitor that we can test further,” says the study’s co-lead investigator, Peter Storz, Ph.D., a cancer researcher at the Mayo Clinic. “We need a new strategy to treat, and possibly prevent, pancreatic cancer. While these are early days, understanding one of the key drivers in this aggressive cancer is a major step in the right direction,” he says. In the U.S., pancreatic cancer is the fourth most common cause of deaths due to cancer, according to the American Cancer Society. A quarter of patients do not live longer than a year after diagnosis. The title of the Nature Communications article is “Protein Kinase D1 Drives Pancreatic Acinar Cell Reprogramming and Progression to Intraepithelial Neoplasia.” Pancreatic cancer can occur when acinar cells--pancreatic cells that secrete digestive enzymes--morph into duct-like structures. This usually occurs after injury or inflammation of the pancreas, and is a reversible process. 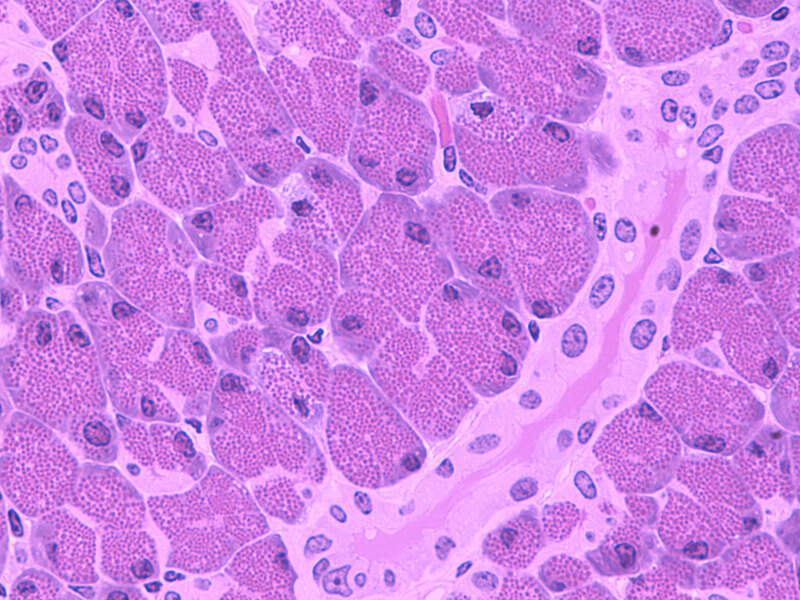 However, the presence of oncogenic signaling (Kras mutations, EGF-R) can push these duct cells to develop lesions that are at risk for tumor development. Researchers have found that pancreatic cancer can be split into four unique types, a discovery that could be used to improve treatments for the disease, according to a study published in the February 26, 2015 issue of Nature. The article was titled “Whole Genomes Redefine the Mutational Landscape of Pancreatic Cancer’. Nature.” An international team of scientists, including Cancer Research UK researchers, found that these four types were created when large chunks of DNA are shuffled around. The team also identified the genes that could be damaged in this way. These four disease types are based on the extent of the cancer’s genetic shuffling, with the tumors classified depending on the frequency, location, and types of DNA rearrangements. This shuffling of chunks of DNA causes genetic chaos with genes deleted, wrongly switched on and off, or entirely new versions being created. The four subgroups were classified as having DNA that was stable, locally rearranged, scattered, or unstable. Among the genetic faults found are some that could potentially be targeted with existing drugs. Study co-lead, Professor Andrew Biankin, a Cancer Research UK scientist at the University of Glasgow, said: “Despite many decades of research into pancreatic cancer we have faced numerous obstacles in finding new and effective treatments. But our crucial study sheds light on how the chaotic chromosomal rearrangements cause a huge range of genetic faults that are behind the disease and provide opportunities for more personalized pancreatic cancer treatment.” The study also suggests which pancreatic cancer patients may benefit from platinum-based drugs – these are commonly used chemotherapy treatments, typically used for testicular or ovarian cancer. Like the shape-shifting robots of "Transformers" fame, a unique class of proteins in the human body also has the ability to alter their configuration. These so-named “intrinsically disordered proteins” (IDPs) lack a fixed or ordered three-dimensional structure, which can be influenced by exposure to various chemicals and cellular modifications. A new study by a team of University of California Santa Barbara (UCSB) scientists looked at a particular IDP called “tau,” which plays a critical role in human physiology. Abundant in neurons located in the nervous system, tau stabilizes microtubules, the cytoskeletal elements essential for neuronal functions such as intracellular transport. Lacking a fixed 3-D structure, tau can change shape so that it forms clumps or aggregates, which are associated with Alzheimer's disease and related dementias. The researchers' findings were published online on February 17, 2015 in PNAS. "In the brain, these proteins need to change shape very rapidly to adapt to different conditions," said co-author Dr. Joan-Emma Shea, a professor in UCSB's Department of Chemistry and Biochemistry. "It's important to understand the relationship between protein shape and function and how you can change the shape. So we used these external agents, small molecules called “osmolytes,” to affect the shapes, or conformations, of these proteins." The researchers not only conducted biological experiments, but also ran computer simulations to understand how these small molecules change the shape of tau and, when they do so, how it affects the protein's ability to aggregate. They found that tau's structure--whether extended or compact--was associated with how easily it bound to other tau proteins to promote the aggregation process.